Flamenco Dancer™(uspp#27666), is aptly named, as this gorgeous double clematis dances to the flush of various colors of reddish, purple and mauve in much abundance on her vine! “Flamenco Dancer™” is able to be ready and presented in bud and bloom for the peak retail sales! 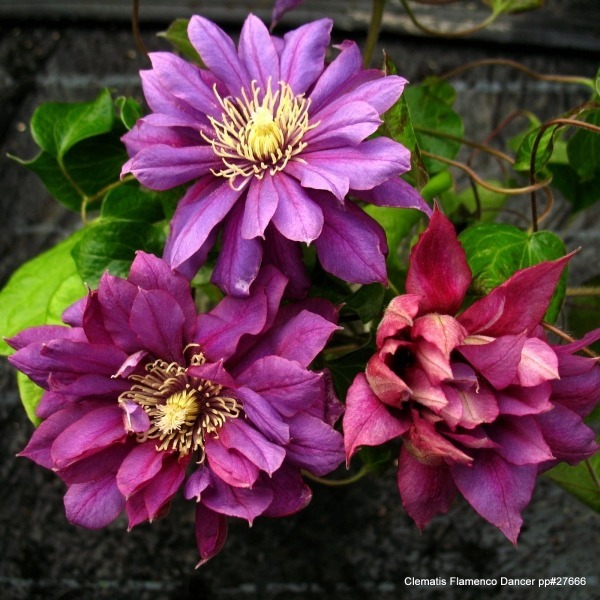 Clematis Care: Plant in sun to partial shade in fertile soil. Clematis should always be planted in a deeply dug, loosened soil with plenty of added humus and nutrients. Clematis are quite able to adapt to most soil conditions. Extremely heavy soils, like clay or limestone can have their drainage improved by adding peat,compost and sand or grit. Always be sure of good drainage. If your garden is acid, give a dressing of lime once a year. The best time to plant clematis in the garden is between August-October, soil temperatures are good then and the roots can establish easier. The best time to plant clematis in a container is in spring.A container will heat up quicker and the optimal temperature at the roots will be achieved. The container should hold at least 20 litres of soil but the bigger the better! Growing medium should be of highest quality. Water regularly during the half year of summer and when watering, keep the lower leaves of the plant dry! Always feed with an application of well balanced general fertilizer and begin in April when growth starts. Further applications could be needed during the summer. Prune:group 2 blooming on new growth (basically reduce all stems by 1/2 after bloom season in Fall). Then, light pruning to the strong buds in April is recommended to promote branching. Support with a trellis of your liking. This clematis has repeat blooming, it is helpful to prune old flowers throughout the blooming season,after finished.